Many of us may not realize that we use more gas in our car during the winter time. Your gas efficiency can drop as much as 20% when the weather dip below freezing. There are many reasons for this such as a cold engine takes longer to reach maximum efficiency, cold air causes more drag and people let their cars idle or warm up for too long. All of these have negative effects on your gas mileage and bill. Don’t let your car warm up for too long. 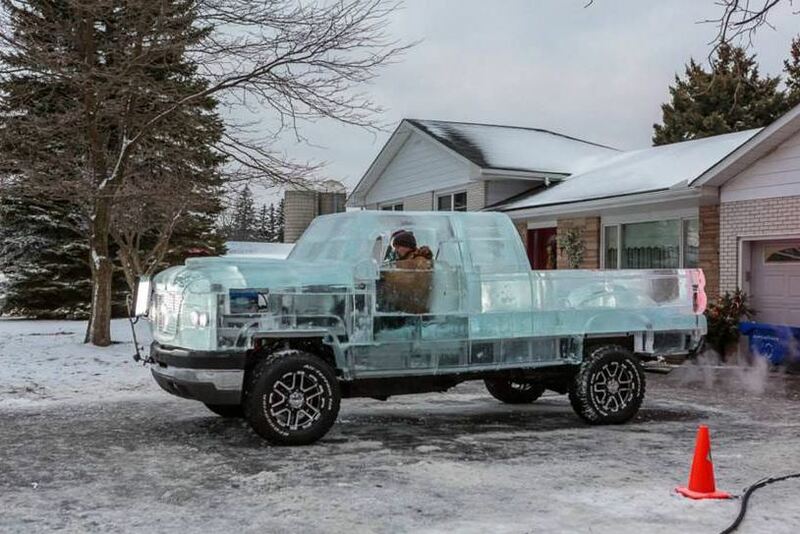 It will warm up faster while driving. You are getting zero miles to the gallon while it is warming up in your driveway. Don’t use defrosters or seat warmers when not necessary they use too much power. Check your tire pressure regularly to maximize your ride. You should do this all year round. Remove any roof racks or anything else that might promote air drag. Park your car in a warm place like a garage or where it might get the benefit of full sun during the day. Use a cold weather oil. Drive reasonably. Jack rabbit starts and stops waste fuel. Follow these simple tips and you will be well on your way to saving gas money for your car and putting a little extra in our pockets. Small expenses can add up to be a big expense in your life. When you talk to most people you will hear them grip about the large expenses in their lives. How much a new tv costs, a car or their heating bill for example. On the same page these same people will spend a large amount of money on small expenses and not even notice it. Take for example buying a large coffee everyday which may cost you $2. That could be $60 a month. Or consider buy a $10 fast food meal once a week. That’s another $40 you spent without realizing it. Small expenses are the ones that typically do not give you anything in return. A large expense like an energy efficient appliance at least helps you save money and performs a task. Small frequent expenses or purchases often do neither. 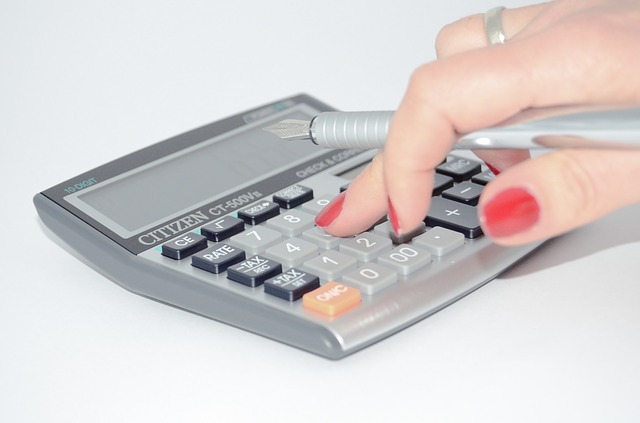 If you want to start saving a bit of money each month then make a list of your small expenses. Getting your monthly bank statement is a good idea. Then start looking for where you can make some cuts. Make your own coffee. Buy in bulk. Buy generic brands. Bring you own water to work. There are lots of ways to shed some of those $5 and $10 expenses each week. Saving money is one of the most important challenges that most of us face on a daily basis. Yet many of us do things in our attempts to save money that end up costing us money in the long run. I think sometimes we get lost in the idea of trying to save money that we forget to look at what we are actually doing to save. Here is a perfect example. An acquaintance of mine would often come back from lunch with shopping bags full of “good deals”. The problem with the good deals is that is was mostly stuff she didn’t need and she was spending money needlessly while thinking she was saving money. I have no need for extra bath towels right now. Why would I go out and buy a bunch of them just because they are on sale. It’s not a very wise way to save money if I am spending it. 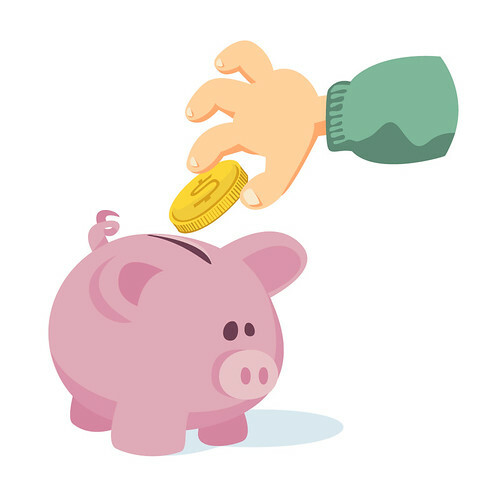 If found this article which documents seven myths of saving money that actually cost you. 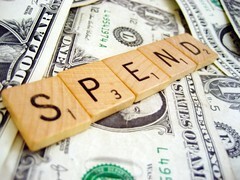 The article goes over sale spending, credit card rewards and the pitfalls of buying in bulk. One sure fire way to save money on your energy and heating bill is through the addition for storm windows. 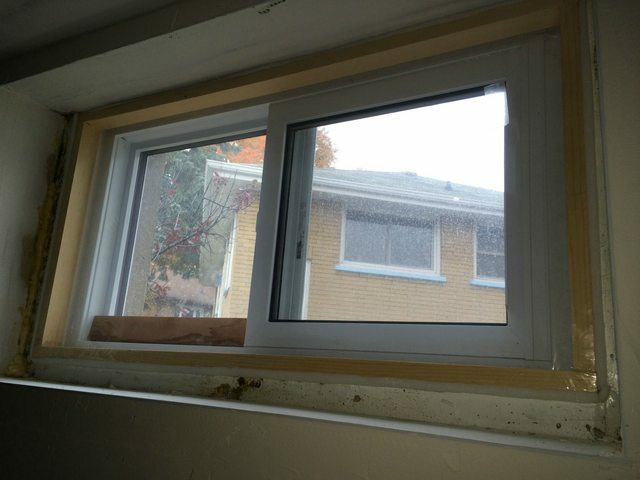 Leaky windows let the cold air in during the winter months and let the hot air in during the summer. Either way you are just throwing your money out the window with your heating and cooling bill. That is why I decided to try a DIY storm window project to help save money on my heating bill. A couple of notes on this project. I am not very handy at all. It really looks like a bigger project than it really is. Trust me. You just need a couple of tools like a miter saw, square, measuring tape and drill. Pretty basic stuff. Most instructions I found on-line involve using plexi glass, this method uses shrink wrap and is easy to build. I estimate that each window probably cost around $30 at a maximum to make. To save money I bought a bulk package of the plastic shrink wrap as I was making a few windows and you can save by buying larger pieces of wood and cutting them yourself into the fitted pieces. The more expensive item was the weather stripping which you shouldn’t cheap on but I will talk about that in a bit. Finally this is by no means my creation. I just basically followed a five part youtube series which was easy to follow and easy to reproduce. I will link the series after I go over my process a bit. The process basically involves building a wooden frame, adding shrink wrap to each side of the frame, using the blow drier to tighten it, tape down the edges and add weather stripping. 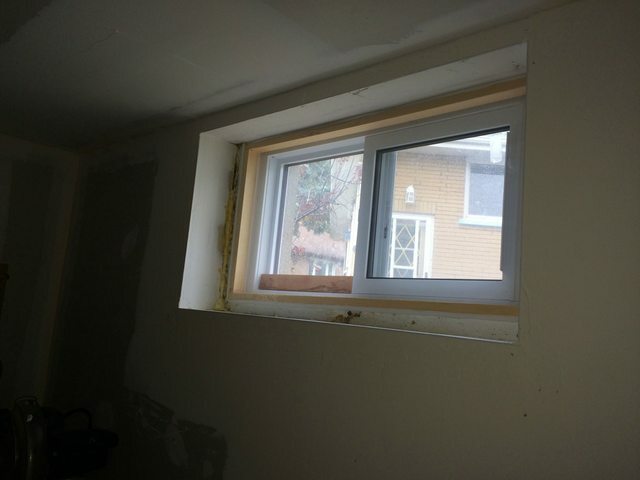 Here’s the finished project fitting nice and snug in my basement window. This window is warm and dry. No leaks and no condensation on the window at all. 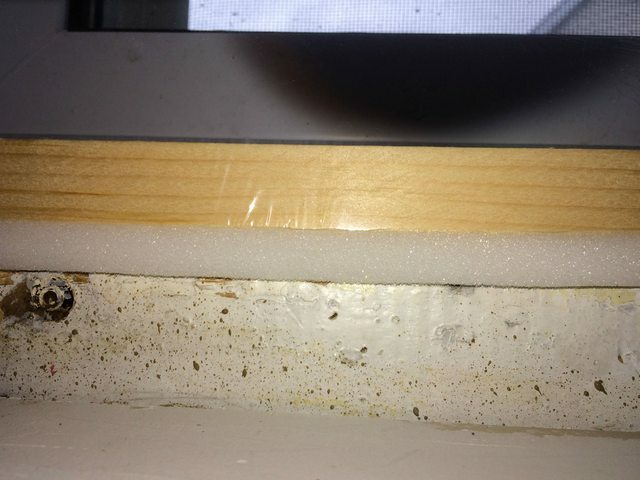 Here is a photo showing the open cell weather stripping. I used the foamy type that can squeeze in order to fit. I tried the closed cell type and there is no play on it meaning you have to be exact in your measurements. Here is the link to the start of the series on Making Storm Windows. It is a five part series of instruction and you can find each link to the next video in the index. Follow along it’s really easy. 1. The double sized tape will pull and maybe pull off the wood frame a little. Just make sure you use a packing tape on tape down the frame where the double sized tape it. He goes over taping the corners down. I tape the entire frame down. 2. Leave yourself lots of overlap when cutting and applying the plastic wrap as it pull and shrinks. If you don’t it will pull and shrink right off of your frame. 3. When he says to drop an inch on each side so your window fits, do it. You will be filling any gaps with the weather stripping and you want to make sure it fits. I put my frame together and tested it to make sure it fits loosely before adding the wrap. 4. He uses a dowel to put the frame together. Too much for me. I used Gorilla glue and then a nail gun and let it sit for a couple of hours for the glue to dry. This was easier for me. I also pre-drilled holes used a small screw on one of my windows. Have fun saving money on your heating bill. My basement has never been warmer and drier. Before putting these windows up I would get ice on my windows. Not any more. Of course we all want to lower our energy bills this winter. It’s not a hard thing to do but take a little bit of elbow grease but with a bit of effort your can lower your winter energy bill. Follow these steps to save money on your energy and heating bills this winter. Turn down the thermostat at night or when you’re not home. 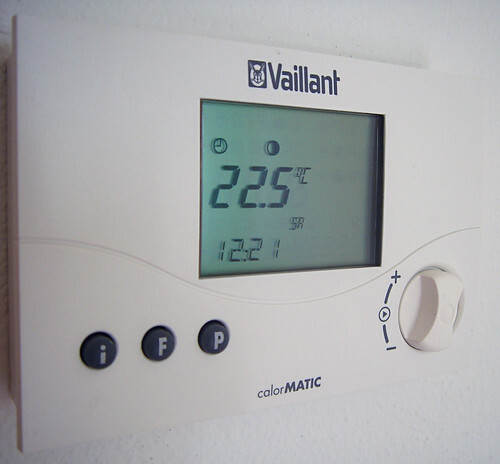 Add a programmable thermostat to control the temperature for home and away times. Check with your energy company, some offer them for free to help you save energy. Open blinds and curtains in the day to let the sun heat your home and close them at night to keep the warm air in and cold air out. Lower the temperature on your hot water heater to 120 degrees. We are on a plan that lets the Utility company control our water heater and it saves us money. Consider buying and insulation wrap for your water heater. They are relatively inexpensive and easy to put on. Clean your furnace filter monthly, we just vacuum ours out and replace it annually. Check your outer doors to see if you can see light coming through, if so add weather stripping. Consider buying a plastic shrink wrap kit to cover breezy windows or patio doors. These are just a few quick tips that will help your save money on your winter energy bill. They are for the most part inexpensive to do and you will see results on your heating and hydro bill. On the reverse they will also help you with your air conditioning bill during the summer months. If you are looking for tips on how to save money this Black Friday we have found a great article for you. These money saving tips come from an employee of a Target store and it is packed with a few tips that even caught my eye. 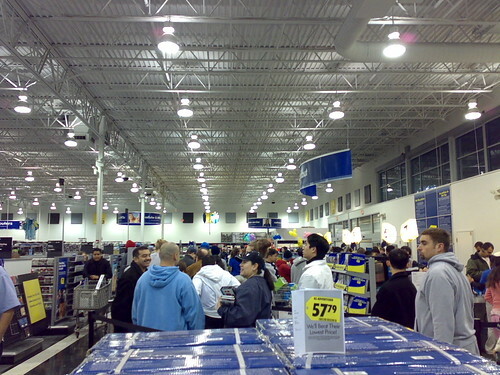 Black Friday always seems a little crazy in retrospect but if you read through this article you might save a little money and might even come out of it a little less bruised. Some of the tips include using mobile apps to save money, leave electronics until Christmas and even scout out online sales for better deals or deals where you don’t have to get into a fist fight with a group of zombie shoppers. 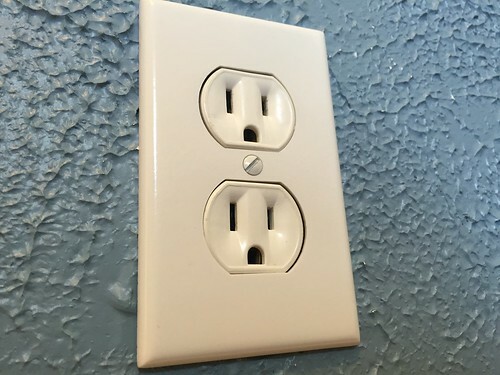 One thing people notice when they enter my house is that all of my electrical outlets on the outside walls have safety plug covers in them. They find them odd because we do not have any small children so they ask why do I use them? It’s simple, energy conservation to save money on my electric and heating bill. Older houses were not built with the same kind of conservation in mind as they do today. You will often find that you can feel quite a breeze coming through the outlets of your outside walls. Try it and see if you can feel cold air coming through. If so then you are wasting heat in the winter and wasting cool air if you have air conditioning in the summer. There are two things you can do which are easy to install and fairly cheap to purchase. The next is to add foam gasket insulators to all of your outlets. They are simple to install. You just take off the cover plate and add the gasket to the outlet and put the plate cover back on. In a matter of seconds you are on your way to stopping drafts from entering your home. You can see the open space from the photo below which illustrates how cold or warm air could be penetrating your home. I found out the hard way earlier this summer of just how important it is to review your expenses often to save money. I had been a little lazy in reviewing a few of my bills and regular expenses and that cost me money that I should have been saving and not spending. Here is an example. My wife signed up for a long distance phone plan quite some time ago when a couple of her friends moved cross country. When reviewing our phone recently I noticed the extra cost on our plan, a cost we were no longer using. We weren’t using it for quite some time to make things worse. If I had been on top of our plan I would have been saving money for months instead of spending it foolishly. The same thing happened with one of my credit cards. I was paying an annual fee that I had no business paying. I didn’t need the credit card any long and rarely used it. I cancelled it and therefore cancelled an unnecessary expense from my budget. We were renting a satellite receiver for the kids room at a cost of $3 a month. I found a used one on Kijiji for $30. In 10 months it’s paid for. Small steps but it all counts. If you want to save money instead of spending it I would suggest taking all of your bills such as cable, phone, cell phone, insurance, bank statements and credit cards and look for unnecessary charges, expenses or plans and cancel them or dial them back. While out at a few stores over the weekend I was very aware of how costly Halloween can be if you want to decorate your house, get your kids costumes and hand out candy. 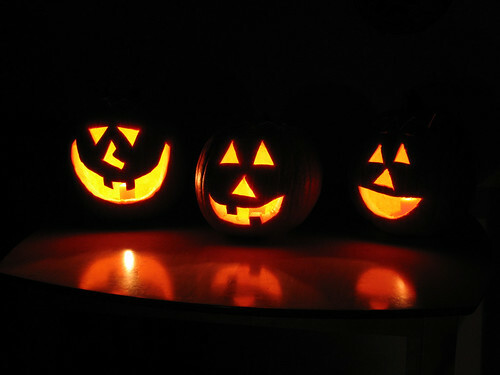 But it doesn’t have to be expensive here are some frugal Halloween ideas to get you into the spirit. 1. Have a scary horror movie marathon with your friends or family. This one can be incredibly inexpensive especially if you plan it on a night where a movie marathon is being shown on tv. This time if year there is always a channel showing a marathon of slasher or zombie movies. 2. Find haunted house or spots in your area like a cemetery and go on a tour. It will take you no time at all to find local haunted or scary places on the internet. Plan a little route and take the family on a haunted tour. 3. Make your own costumes instead of buying or renting commercial costumes. I did this all time when going to Halloween parties. Find some old clothes around the house and make up your own costume such as a farmer, hobo, maid or any other common worker type. Add some make up from around the house and zombify your costume. 4. Make your own Halloween snacks instead of buying expensive store bought candies. You can make things like candy apples pretty cheap when compared to buying candy from stores. 5. Make your own decorations. There are lots of ideas online on how to make your own decorations which can be way cheaper than buying from a store. Remember, your local dollar store probably has most of the items you will need to make cheap Halloween decorations. Halloween like any other holiday doesn’t have to be expensive. It just takes a little planning and researching and you can do it on the cheap and start saving money. 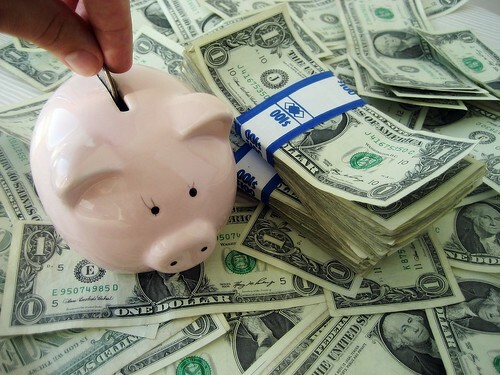 Here is a practical article on how to save money. You don’t have to be rich you just have to make a concentrated effort to put a little bit away each week. By scrimping a little and cutting down on some of your expenses you can save a little each week. The little bit can add up to bigger and better things over the years. Take a look at the statement below and you will see the impact of saving even a little bit of money. Follow up on these great tips and implement them in your life and you too can save money each and every week. That little bit you save can really add up in a hurry.